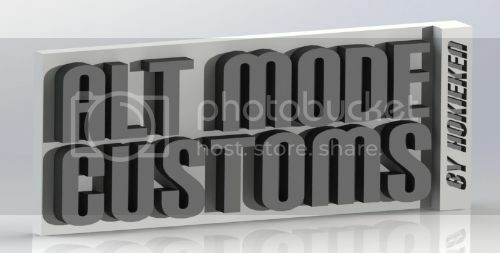 Today I would like to show You my latest custom. It took me about a year to complete it (of course I was not working 24/7 and had a few smaller projects during building process). 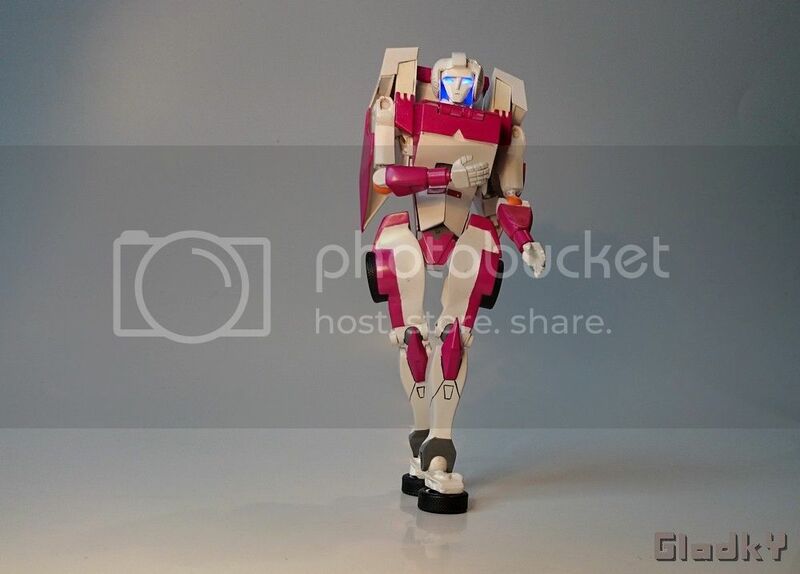 I present to You my Scratch built Masterpiece Arcee. I deditcate this custom to my wonderfull wife, who always supports my work. My mostly used raw material was polistyrene. 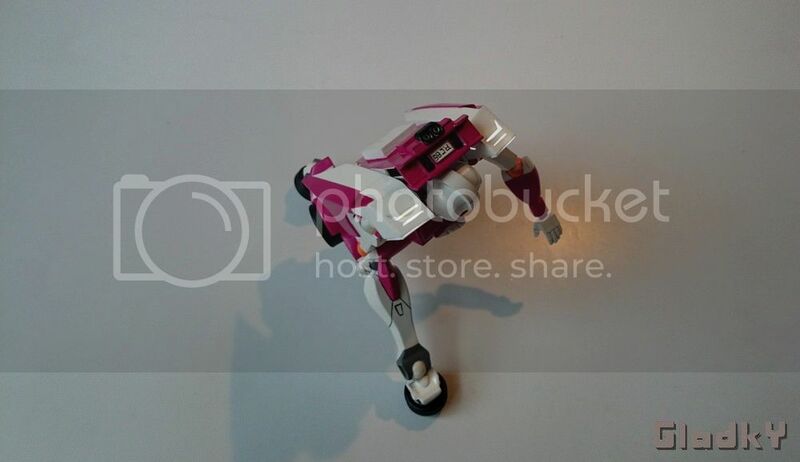 One of my biggest challenges was to avoid putting all the car parts on Arcee's back. 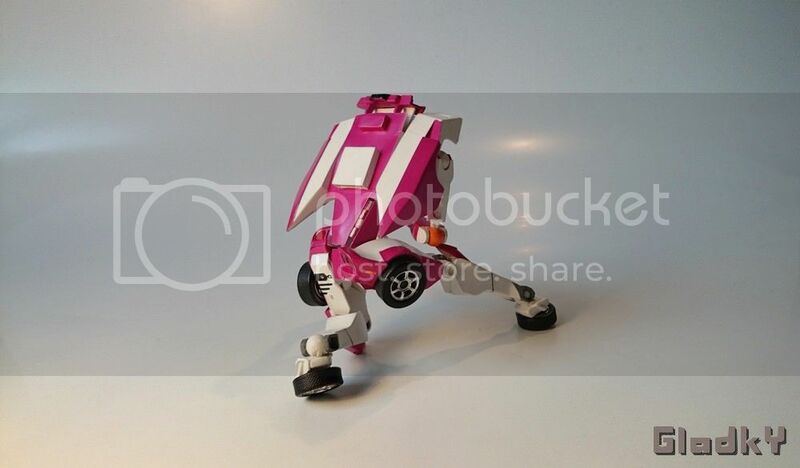 I wanted to create very sleek robot mode and as You can see the back is junk-free. Thanks to above picture You can see back proportions better. 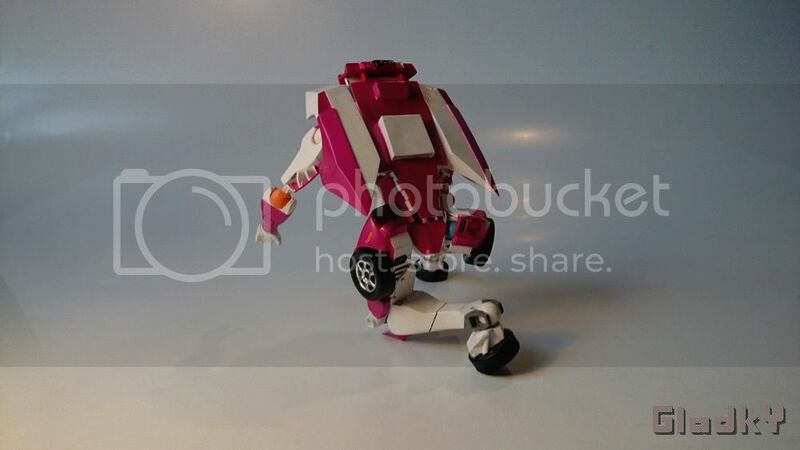 I was also able to put a small easter egg on car mode's registration plate. 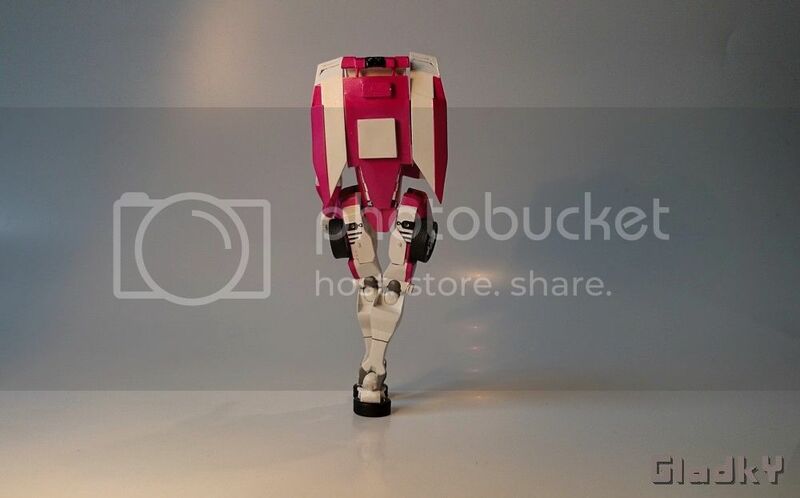 Thanks to many Lego Bionicle ball joints and custom made double ball joints Arcee is a really highly articulated figure and can be posed in many ways standard masterpiece figure can't. Time to get a closer look on head. 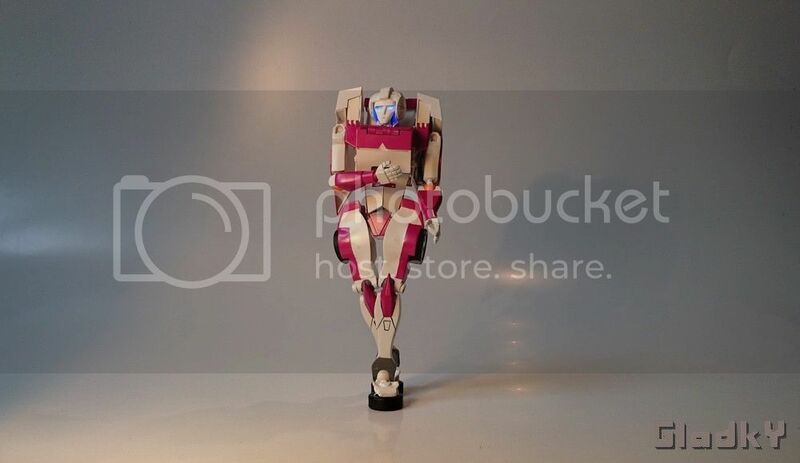 Just like most of Arcee, it was also made from stratch. 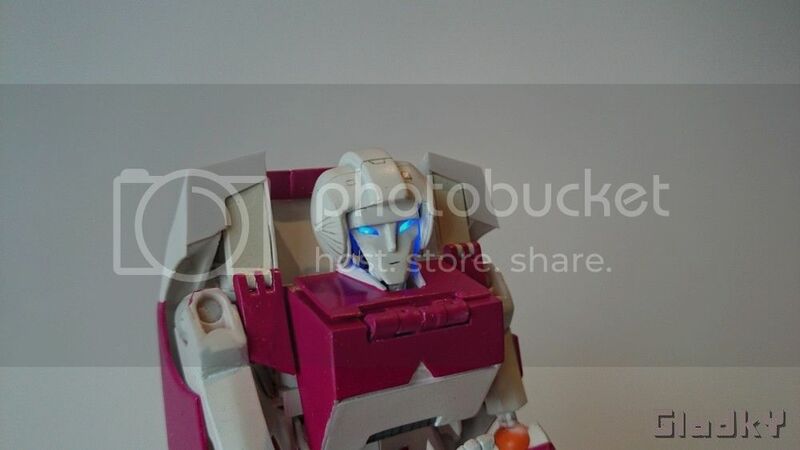 I created custom light up feature as well using two small blue LEDs for her eyes. 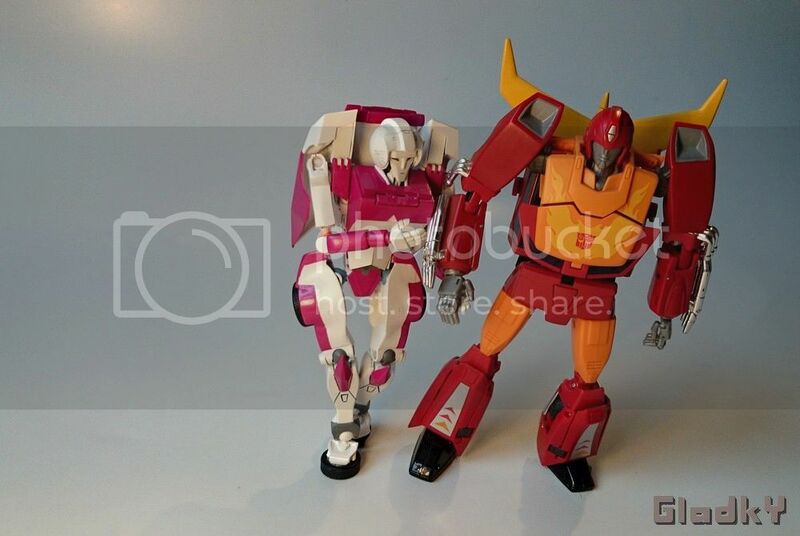 While designing Arcee I decided to slightly modify her original look. The most noticable difference is new paintjob. I decided to replace light pink with a bit darker colour. This decision also helped to differentiate base colours. To give whole custom a better look i added some metallic paste to both base colours. Before painting I sanded all the parts with water sandpaper. This step was reapeated after every layer of paint to make sure surface will be smooth. At the end I used three coats of gloss clearcoat to make paintjob look more like metallic car paint. 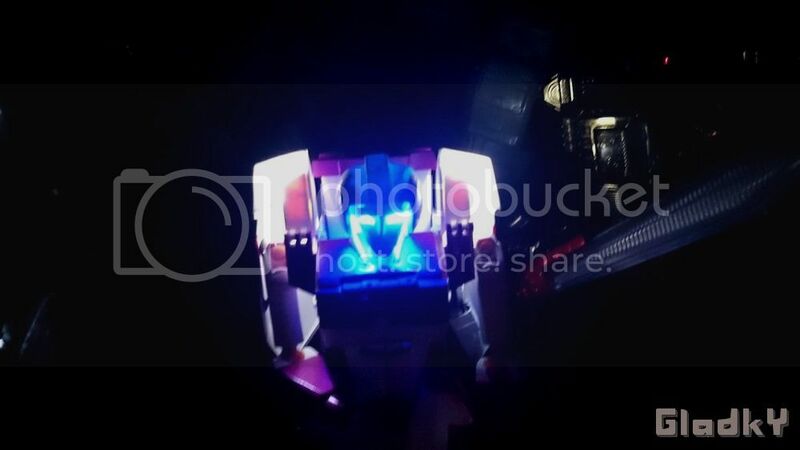 Vehicle mode headlights can be switched on also in robot mode. Headlights are operated within different electrical circuit than eyes. This allows to turning them on and off individually. 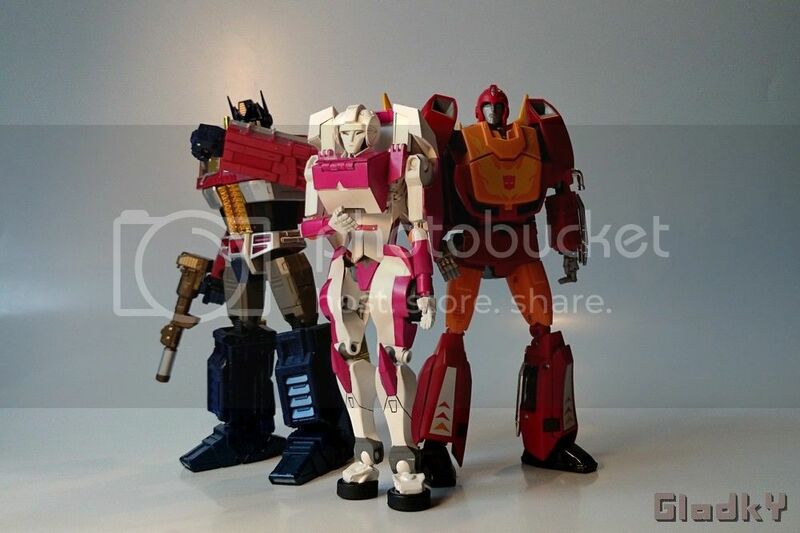 Time to compare Arcee with some stock Masterpiece Transformers. 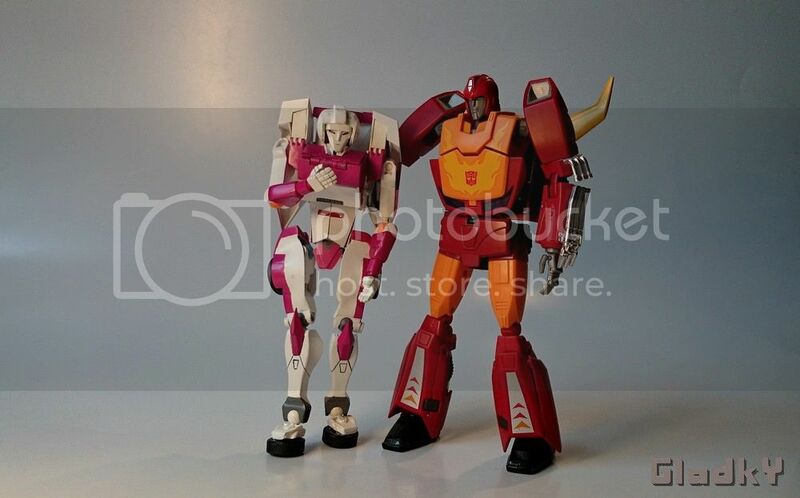 I have designed Arcee to look good next to Hot Rod. I believe they really match. Time for one more comparison. 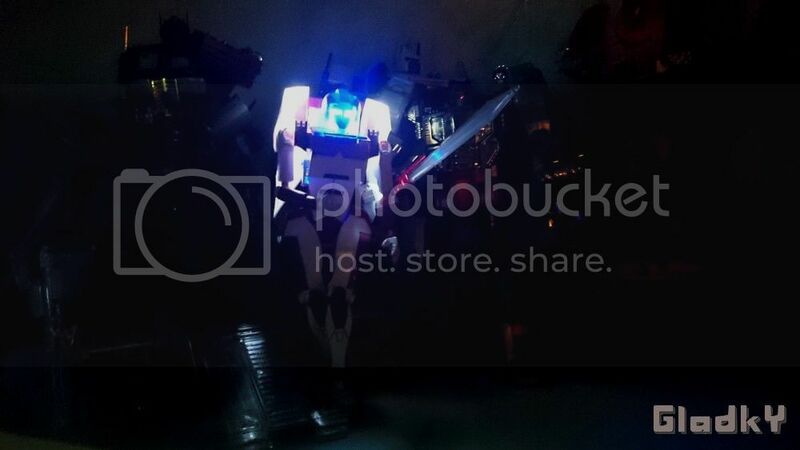 This time let's add Year Of The Horse Optimus Prime. 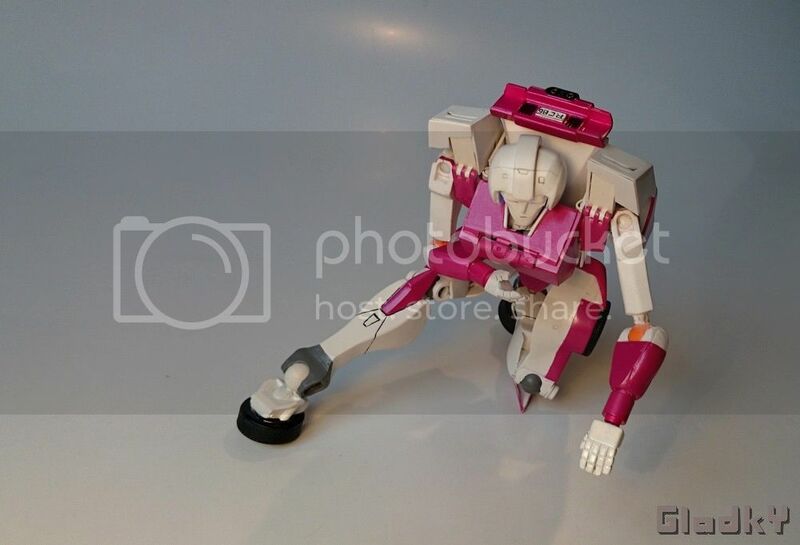 Arcee transforms into newly designed alt mode. I decided that original vehicle didn't age too good. 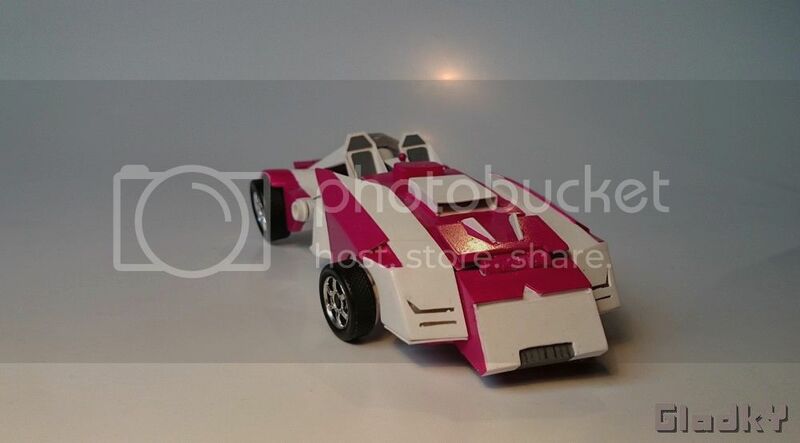 That's why I redesigned it to look much more modern, but I still wanted it to be similar to G1 car. I also decided to slightly rearrange alt mode colours, to match my version of the car. I got rid of windshield for two reasons. One of them is an omage to Mercedes SLR Stirling Moss. 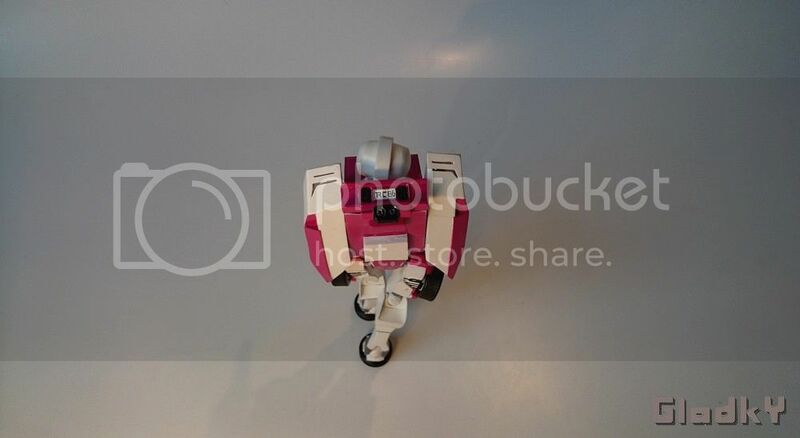 Another reason was to make robot mode more sleek. I gave my vehicle mode some interior parts. 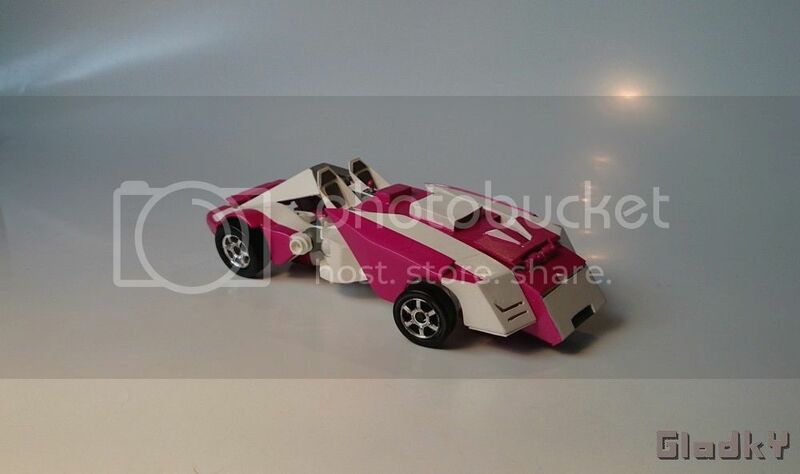 It eaven has small gearbox and seats can be tilted back and forth. alt mode has chromed wheels and rubber tires. Front wheels can be moved to simulate turning left or right. in the above picture You can also see headlights turned on. That's really impressive. The face looks a bit weird though...much too angular. Yes, You read licence plate correctly. I was wondering if someone would discover this easter egg I hid within my custom:). And Yes, it means exactly what You wrote. I am a huge fan of Transformers The movie:) Congratulations mister Holmes, perfect deduction. Yes...please put it in my hand and let me see. 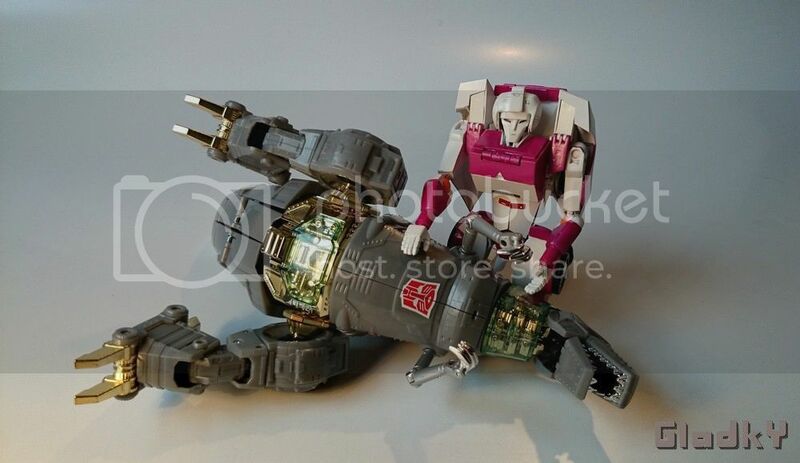 I still can't believe this thing transforms! You are an artist!